Arsenal manager, Arsene Wenger, has blamed his defenders’ lack of focus, for their 3-1 defeat to Manchester United at the Emirates Stadium on Saturday. Speaking after the game, which saw their 12-game home unbeaten run end, Wenger said he was “angry and disappointed”. The Gunners were 2-0 down after 11 minutes, after centre-backs Laurent Koscielny and Shkodran Mustafi both gave the ball away sloppily. 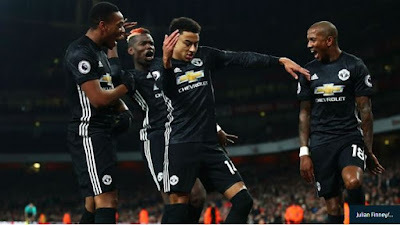 Although Alexandre Lacazette pulled one back, Jesse Lingard netted a third for United. “I don’t know if you’ve watched many top-level shots, but when you have 33 shots on goal in a game of that stature, it means our dominance was top class. But I’m angry and disappointed because in the end we have nothing to show for it,” Wenger told a news conference.